What is Power Music Store? 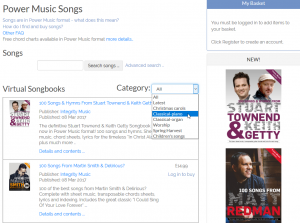 Power Music Store is an online shop where users of Power Music can purchase “virtual” songbooks in Power Music format. You can access all the songs that you purchase using Power Music Box – our unique cloud storage system. See this previous blog “What is Power Music Box?” for more info about the Box. What is the advantage of this type of store? When you buy music from other stores you either buy a physical book or a PDF or similar for printing. This is fine if you want to use paper. Alternatively you can import these to Power Music by scanning or PDF import and then add the relevant information on authors, categories, copyright etc. Power Music Store means we have done the work for you in preparing the content and all you have to do is press a button to get all the content and indexing you need in the software on your iPad, PC or Mac. This means they are ready for you to use in the software for practice and performance, and easy to find using the above information. First you need an account in Power Music Box. 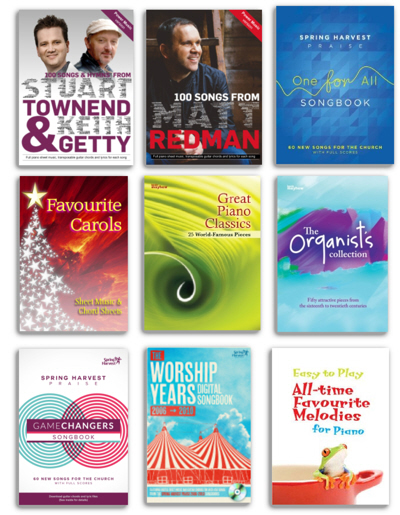 A Free account will let you buy and store an unlimited number of songbooks which are purchased from the store. 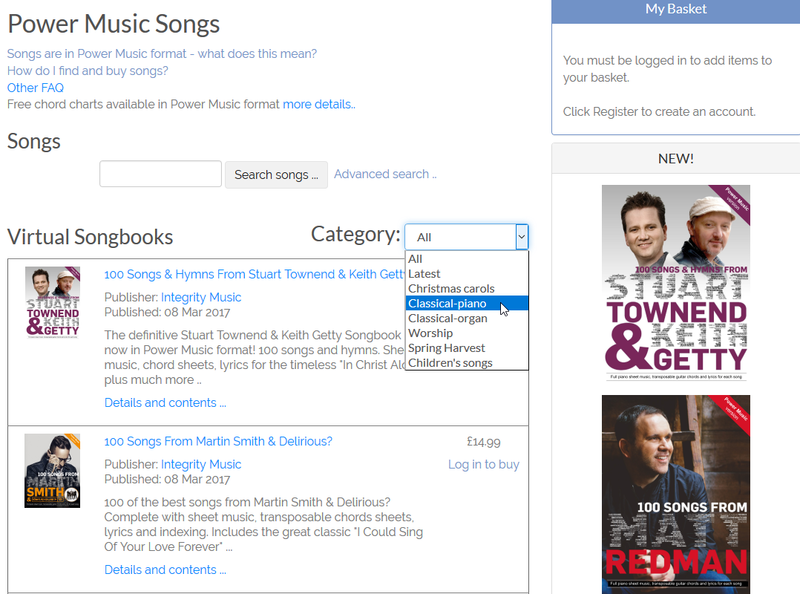 The store shows a list of songbooks which can be filtered by category. At this point in time our collection is made up of worship music and classical piano and organ music. Recent additions have been songbooks from Integrity Music, free chord charts and reflective instrumental music for piano by David Baroni: A Quiet Place. All songbooks have been created in partnership with the publishers, therefore it is all completely legal. Selecting a songbook shows the details and content and you can simply add the songbook to your basket. Some songs are available to buy individually and these can be found using the ‘Search’ feature. Once you have completed your purchase the contents are available for download to any edition of Power Music, including the free ones! The contents remain in your Box account so that you can download to your iPad as well as your PC or Mac. All you need to do is go to ‘My Box’ in the software, log into your account and download the songs you want. Once you have downloaded the songs you can edit or transpose the chords. You can change the layout to suit your device – repeat choruses, display 3 pages per screen if you have a wide screen. This is the big advantage over physical books or even non-editable PDFs that you can buy from other stores. Some songbooks that you buy elsewhere contain a voucher code for Power Music Store. The Spring Harvest songbooks from the last few years have voucher codes printed inside. Voucher codes are redeemed in the software, not on the website. All editions of the software have a ‘Redeem Voucher’ section. You will be asked for your login details for the Box, then type the voucher code into the text box when prompted. Once the code is accepted the songbook songs are added to your Box and you can download them to Power Music. Voucher codes are unique and can only be used once. However, the songs remain in your Box as if you have purchased them so if you change your computer or iPad you can download them again. Please post them in the comments below and we will do our best to answer you. The virtual songbooks are specific to our Power Music software and cannot be exported as .pdf for use in other software.